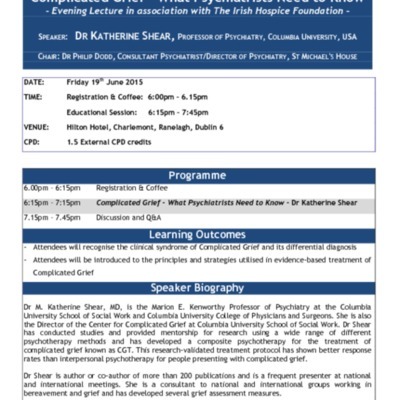 Dr Susan Delaney, clinical psychologist and bereavement services manager of the Irish Hospice Foundation developed and expanded knowledge of complicated grief among Irish psychologists and health care professionals. Dr Delaney, whose research work focused on complicated grief developed workshops and professional masterclasses on the emerging research and practice around complicated grief. She studied under the supervision of Dr Kathy Shear of Columbia University. 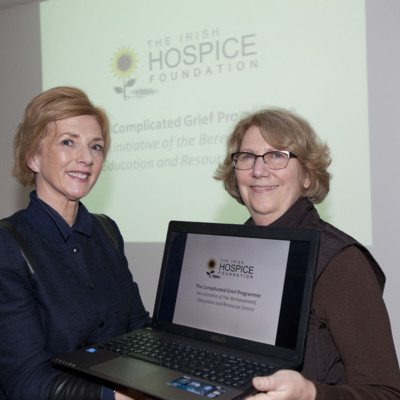 In January 2014 the Irish Hospice Foundation expanded services in complicated grief, launching the Complicated Grief Programme with Dr Kathy Shear as Patron and Dr Susan Delaney as Director. The programme included clinical practice for the treatment of complicated grief with a small number of clients.